On their third full-length, The Littlest Viking explore an array of musical styles with a forceful punk attitude while embracing the precise technicality of twinkly math rock. Feelings & Stuff is not the most cohesive record, but what the duo lack in consistency, they make up for with a ferocity similar to a Tiny Moving Parts show with more memorable songs. The California-based two piece pack a punch with both intensity and precision that few bands can make sound effortless. Look at a track like “Baby Boomers are the Worst,” the band teeter between math rock-inspired emo and power-pop’s tonality. While locking into tight musical onslaughts, the band still manage to retain a production that make the two sound gritty, sludgy, and larger than a two-piece. “Straight People… Am I Right?” is probably one of the better examples of the band’s pop-tendencies, as they lay bouncing chiming guitars over a straightforward, clean-ish garage rocker. Christopher Gregory and Ruben Cortez have a solid interplay with each other. Where Cortez’s guitar tends to light up the songs most of the time, Gregory’s scream is an attention grabber whenever he pierces through the mix. The songs occasionally lend themselves to sound like Japandroids playing Midwestern Emo, but they rarely keep that tempo up, as the pair often tone down their songs right after (i. e. the back to back tracks “Solid Girl Gang” and “Kevin Sorbro”). The biggest problem that The Littlest Viking faces is this lack of consistency. The band bring a sense of intensity that even some of the most popular guitar-tapping emo bands lack, but they spend too much time trying to fuse the intensity of Tiny Moving Parts with the chilled out technicality of American Football. They seem like they simply need to find their voices a little bit more and try to hone in on a more singular sound rather than combining too many of their influences. Still, Feelings & Stuff shows a band that has pop sensibility and can make themselves sound much bigger than the confines of their instruments. When the band leans into loud, scream-along, chorus-driven rock, it’s moving. “Deathdrop for Jesus” and “White People…Am I Right?” both see the band flexing both their skills and finding a way to confine their sound to a more straightforward, anthemic indie rock. 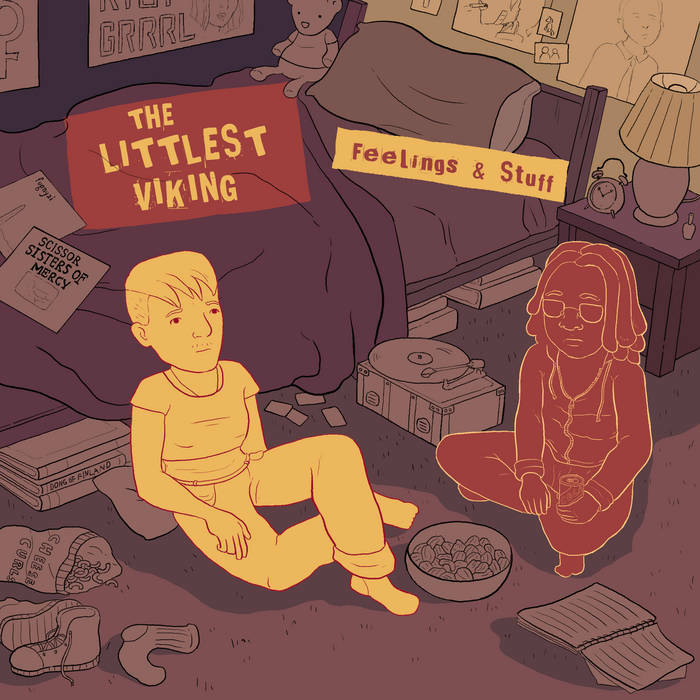 As they continue to grow as musicians, The Littlest Viking are incredibly adventurous, but if they can find a way to channel their songs into a more singular form, they can be great.